Traditional beef Wellington is surrounded by a puff pastry crust. 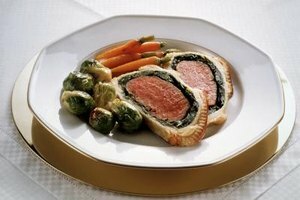 Decadent and delicious, beef Wellington makes an elegant main dish for any dinner party. However, with some shortcuts and substitutions, beef Wellington also becomes a quick and easy entree that is sure to become a staple in your family's weeknight dinner line up. Easy side dishes make beef Wellington a meal worth savoring. Beef Wellington is incredibly rich, so simple side-dishes let the main dish shine. Martha Stewart recommends serving twice-baked potatoes and broccoli with a touch of lemon along with beef Wellington for an elegant Christmas menu. These simple sides will definitely be a hit with your kids, especially if you drizzle creamy dressing on the broccoli. Chef Tyler Florence roasts fingerling potatoes with rosemary, garlic, sage, and thyme for his beef Wellington menu, rounding out the plate with a warm salad of radicchio, escarole, and Swiss chard. For a distinctly retro touch, serve beef Wellington with a side of green beans almandine, either fresh or frozen. This side dish was frequently paired with beef Wellington during its heyday in the 1960s. A traditional beef Wellington requires pate de foie gras, rich Maderia wine, and excellent cuts of beef, resulting in a rich dish that can drain the checkbook. Most recipes for beef Wellington can be made budget-friendly by omitting the pate de foie gras, which is an expensive paste of ground goose livers. While the traditional recipes are delicious, they won't tempt your kids' taste buds. Kate Miller of The Frugal Kitchen at Encyclopaedia Britannica swaps out pricy tenderloin for ground beef, shaping balls of meatloaf that are then smothered in sautéed mushrooms and rolled in pre-packaged crescent roll dough. If your family isn't a fan of mushrooms, consider substituting the offending fungi with sautéed onions instead. Many recipes for beef Wellington require that you roast the meat for 20 to 25 minutes, then allow the beef to cool entirely before proceeding with the rest of the recipe. To save time, roast the beef the day before your party and let it chill in the refrigerator overnight. When you are ready to continue with preparing your dish the next day, remove the roast from the refrigerator and allow the meat to warm to room temperature. Preparing a duxelle of mushrooms or your own pate foie gras can be time-consuming and extremely messy. Purchasing a high-quality brand of pre-made pate foie gras saves several steps in making beef Wellington, as does using pre-made puff pastry as the crust for your dish. Pre-made puff pastry can be found in many supermarkets in the frozen food aisle. The typical recipe for beef Wellington feeds anywhere from 6 to 12 people; for large crowds, some adjustments may need to be made to adequately feed your guests. Preparing individual portions of beef Wellington means you'll have enough to feed a crowd, and you'll have more control over how evenly the meat cooks. Visit your local butcher and ask him to slice beef tenderloin into as many pieces as you will need, with each slice measuring approximately 1 1/2 inches thick. You can also substitute a good quality beef steak for beef tenderloin slices. Cover the slices of beef as you would a whole roast and wrap each piece in a square of puff pastry.